Large planters can be very heavy if filled with soil and drainage rocks. Reuse dense Styrofoam to fill the bottom instead. 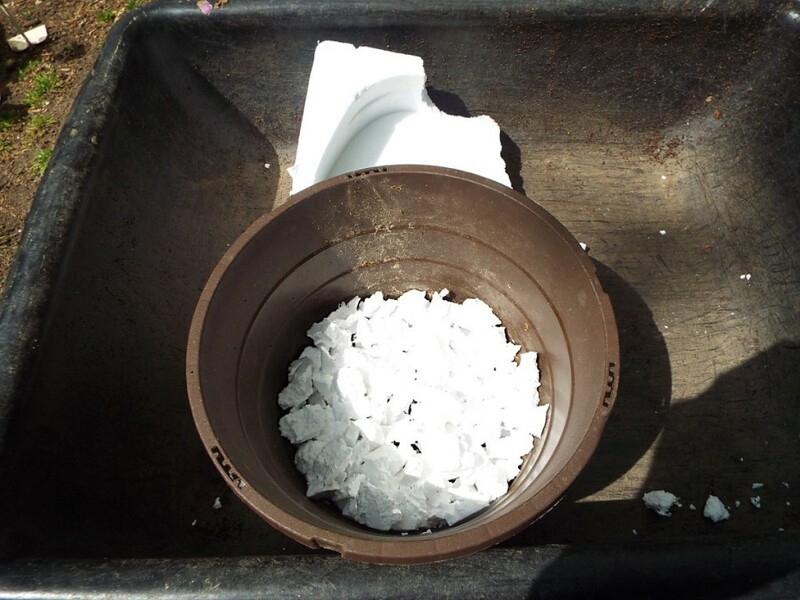 This is a guide about using Styrofoam in plant containers. I grow many plants in containers, from small pots to 5 gallon buckets, and large recycle bins. A lot of these containers will get a layer of Styro chips before any soil or other medium is added. I have two reasons for adding the Styro. I often find it necessary to move large containers filled with soil and plants. The addition of a layer of Styro significantly reduces the weight of the container. The other reason is that the Styro helps provide excellent drainage, giving me less chance of root rot and related problems, and it reduces the weight of hanging baskets. I have noticed that the quality of hanging basket material diminishes more each year. I usually have a couple come crashing to the ground. I have experimented with most types and grades of Styro. Loose beads are of no use. All that work their way to the top of the container will be blown and scattered by the wind. Packing peanuts would seem ideal. They are clean, usually readily available, and don't have to be broken into pieces. With all these advantages, I still won't use them. Due to their smooth exterior, they are not the best at providing good drainage. They can be a mess should you need to re-pot a plant and retrieve the soil. I use Styro which once was used for shipping large items such as televisions and other electronics. There are at least two grades of Styro used for this purpose. There is a lot of difference in these two grades. One is lighter and seems to be made of Styro beads pressed together. 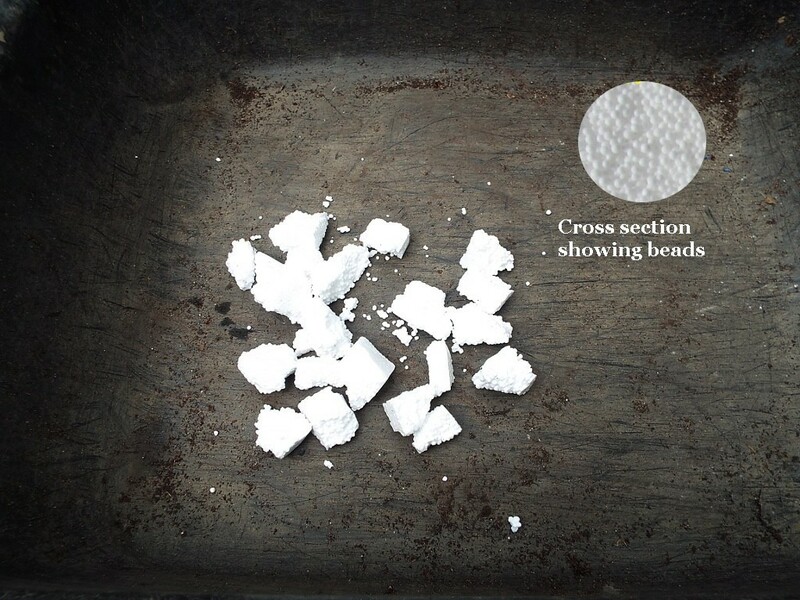 These beads have a tendency to break loose from the torn chip, and just as loose beads, can scatter across the lawn at the slightest puff of wind. The other is much more dense, and consequentially, is harder to break into chips. I find it well worth the extra effort. 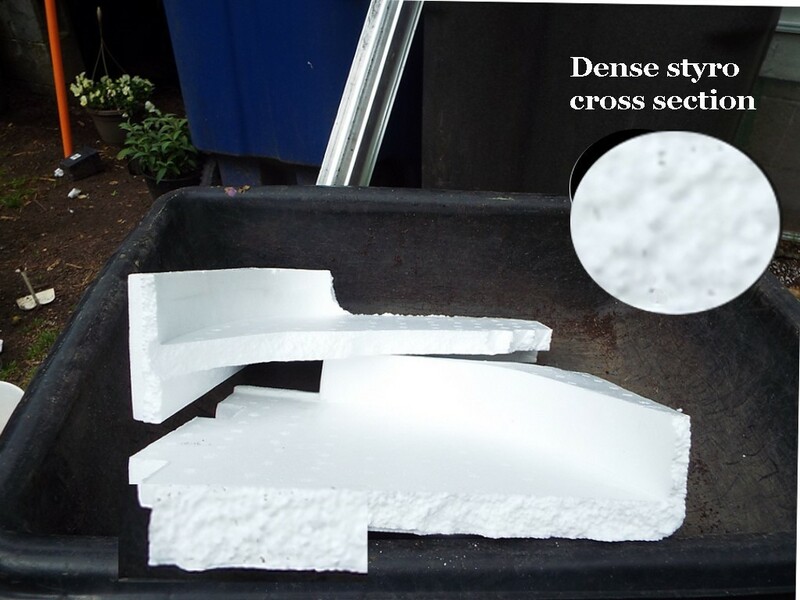 This denser Styro will last for many years in a plant container without causing a mess of any kind. I am fortunate in that as often as I shop at Walmart, I often find a jobber in back of the store, unpacking items which were shipped in Styro. Such was the case, yesterday. The fella had already filled two very large plastic bags with Styro. I asked if I could have some. He said, "You can have all you want. It will save me from taking it to the dumpster". So, I managed to get an excellent material for use in plant containers, just for the asking. And I did my part to keep several large bags of one of the worst environmental offenders out of the landfill. One man's trash is truly another man's treasure. If you don't find the occasion to get this dense Styro from stores, you can ask friends and neighbors to keep what they would normally throw in the trash. I can see many ways in which this is better all around, for all plants and all people. And since we are still in our infancy, knowledge-wise, I'm sure there are many unseen advantages, too. Love this idea. I use the peanuts but didn't realize they were not good for drainage and yes such a pain when I want to repot. I will have to check around and see if I can find some of this. Good luck, though you shouldn't need any. This stuff is about everywhere. Women have their crocheting and menu organizing. I have styro. When it's too early to go to bed but too late to start anything major, I take out a slab of styro and break it up. Can you use this for pots used for growing edible items like herbs? Do any chemicals leech into the soil that I wouldn't want in food?